A2 Studios brings another kit for Don Bradman Cricket 14. Yes, it's the time for BlackCap's Limited overs outfit! 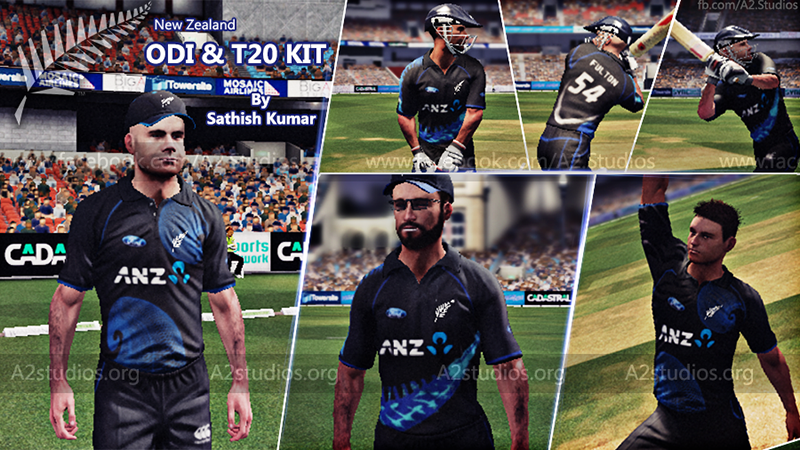 Download Free New Zealand ODI-T20 Kit Patch for DBC 14 Now. Accurately designed kit look gorgeous in game. You must try this beautiful kit made by PSK. Installation and Download links are given below. Enjoy! i) Set the Top Model to “Current” and pattern to 9.
ii) Set the Pants Model to “modern” and pattern to 9. 6. Now Choose the correct colors of ODI kit in the “clothing” option and check the invert box. 7. GO Back again,select “Uniforms” and then, “T20:”. i) Set the Top Model to “Current 2” and pattern to 9. 9. Now Choose the correct colors of T20 kit in the “clothing” option and check the invert box. 10. Also,modify the shirt number , cap and helmet colors. Thats all! You’re Finished.